The research is in and clear: Photoelectric smoke alarms should be your choice for fire safety in your home. 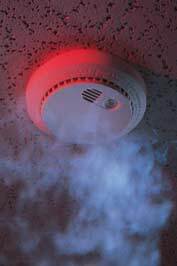 There are basically only two types of smoke alarms: ionization and photoelectric. Which do you have? 90% of homes have ionization technology, which unfortunately is less effective and should be replaced. Photoelectric technology is proven to be less prone to false alarms, and they sound far earlier than other systems during smoldering fires. This gives your family more time to react in a real emergency. Remember: all smoke alarms should be replaced every 10 years. If you’re considering “covering all of the bases” with a combination alarm (ionization and photoelectric) are not recommended. Read more in Silent Alarms; Deadly Differences by Skip Walker.